Maastricht University started in late 2008 with the implementation of its bachelor’s excellenc program under the National Sirius program. This excellence programme was named MaRBLe (Maastricht Research Based Learning for Excellence) and is a weighted component within the third year of the regular bachelor program. Excellence for the university means above average developed academic skills, but also above average enthusiasm and passion to develop.At the FHML we choose for the option to have a faculty wide project called MaRBLe+, with the emphasis on career development competencies. Furthermore, interdisciplinarity was also one of the cornerstones of the program, meaning students from the various tracks were mixed in the MaRBLe groups, and in this way they learned that Healthcare is broader than their track alone. Students were selected to participate in this excellence program, from:Molecular Life Sciences, a specialization with a strong focus on the molecular basis of health and disease;Biological Health, focuses on the complex physiological regulation systems within the body that control the equilibrium (homeostasis) governing health and disease;Human Movement Sciences, a specialization about the processes and structures in the body that enable movement;Policy, Management and Evaluation of Health Care focuses on the complex relationships within the health;Biology and Health examines the influence of diet, physical activity, and environmental factors in the development of diseases;Mental Health looks at the biological, psychological and socio-cultural aspects of psychopathology;Prevention and Health focuses on disease prevention, early detection of diseases and help people to cope with their illness.The program consisted of various workshops, a meeting with a career coach and the opportunity for the students to practice in giving scientific talks to a broad audience and not only their fellow students from the same track. 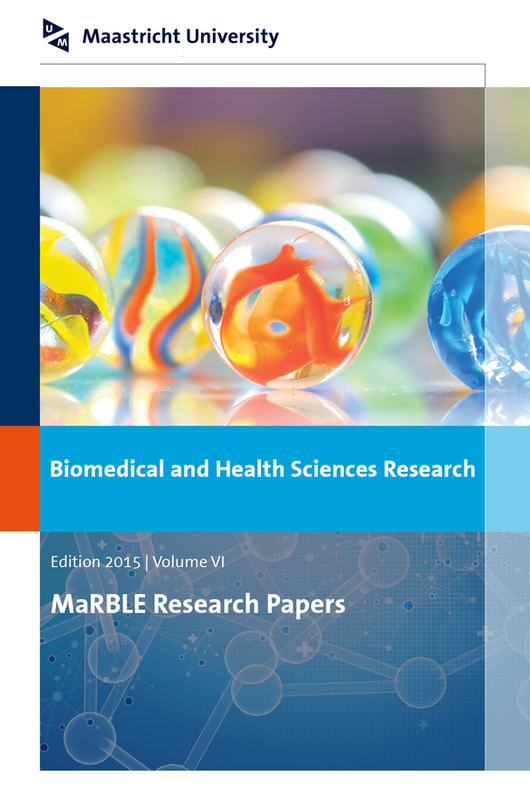 Furthermore, the students had the opportunity to present the findings of their bachelor thesis esearch during the MaRBLe+ symposium in July 2015.This series contain the summaries of the bachelor thesis of the MaRBLe + students of 2015, and represent the different strands of research in the various bachelor tracks of Health Sciences and Bio Medical Sciences programmes in the academic year 2014/15. It should be noted that some of the work is considered for publication in a peer reviewed scientific journal and therefore the content of the presented thesis summary may be altered to prevent double publication of scientific work. This publication could be the first step in a research career for students and is an ideal way to spread their research findings to a broader audience. Conflicterende gezondheidsadviezen betreffende vitamine D: hoe maken ouders een afweging? The influence of dogs on the physical activity and social network of the owners: A qualitative study.